We continue our series focusing on the classic Hollywood monsters from the Universal Pictures era by taking a look at Frankenstein. Unlike Dracula, where Bela Lugosi basically only played his character in one classic picture, the Englishman Boris Karloff played Frankenstein’s monster in three pictures; two great classics: the original Frankenstein and the sequel The Bride of Frankenstein, and the very good third movie in the series, The Son of Frankenstein. The basic premise of the first movie was the creation of a man from the body parts of other dead souls. 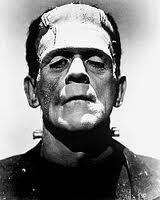 Boris Karloff, actually played Frankenstein’s monster, not Dr. Frankenstein himself. Colin Clive played Dr. Frankenstein who was so drunk with power that he began to think of himself as a god, yet in the end tried to destroy his own creation. However, for most of us, it was Boris Karloff as the Monster who created one of the most single iconic movie performances of all time. Anyone who sees a child puts his arms up and walk with a lumbering stride immediately knows the reference. What made this performance so iconic? For me it was the pathos that Karloff brought to the role. He imbued the Monster with such a tortured soul that he literally cried out for love and acceptance in a world which was terrified of him. Even the scene from the original movie where he tosses the girl into the lake drove home the humanity that Karloff brought to the role. My suggestion is that you settle in one weekend night for an autumn’s eve of Karloff in the original Frankenstein movies. They are a visual, audio and an intellectual treat for all. Even if you enjoy none of those senses, you can always revert to your childhood and remember the terror he brought the first time you saw the Monster on the screen. So how does Frankenstein relate to compliance and ethics? Exhibit A for today is my fellow Texan Lance Armstrong. Yesterday, in the FCPA Blog I wrote about Armstrong and ethical values in the context of engaging in conduct which is so unethical, that you would be embarrassed to tell your children about it. Today I want to focus on some other aspects of Armstrong. Should he be analogized to Dr. Frankenstein, the Monster, or perhaps both? Initially, it should be noted that Wednesday had to be one of the worst PR and financial days a person can have because, not only did Armstrong resign as the chairman of his cancer charity, Livestrong, but, as reported in the Financial Times (FT) article “Disgraced Armstrong Ditched by Nike, RadioShack and AB InBev”, sponsors Nike, RadioShack and AB InBev all announced they were ending their respective relationships with Armstrong. The FT article reported that Armstrong earned an estimated “$15.3m” from endorsements in 2011 and that the “Nike contract alone was worth between $8m and $12m annually”. Hope he still has money to pay his legal bills going forward. To top it off, Armstrong’s most vocal commercial sponsor, Nike also announced it was severing ties with him via a terse Press Release that stated “Due to the seemingly insurmountable evidence that Lance Armstrong participated in doping and misled Nike for more than a decade” though they did go on to explain they were doing it “with great sadness” Of course this was one short week after standing by their man with the statement that “Lance has stated his innocence and has been unwavering on this position.” Oops. An article in the online publication Slate, entitled “How Lance Armstrong Is Like Lehman Bros.”, Daniel Coyle looked at the fall of both Armstrong and Lehman Brothers. Coyle found that in the case of both Armstrong and Lehman Brothers “a culture of excess and risk led to record-breaking performances, and then to catastrophe. In both cases, the behavior in question was driven by a distinct set of social forces, including a win-at-all-costs culture, lack of regulation, and the credulousness of journalists and the public.” Further, the sport of cycling is like “a trading floor: small, tightly knit teams competing daily, with great intensity and effort, for marginal rewards. A single percentage point can make the difference between winning and losing.” So what are the lessons for the Foreign Corrupt Practices Act (FCPA) and UK Bribery Act practitioner? While in cycling there are only 3 places on the podium, Lehman Brothers seemed to misunderstand that in the business world, there can be multiple winners. I have heard both Preet Bharara, the US Attorney for the Southern District of New York, and Stephen Cohen, Associate Director, Division of Enforcement of the Securities and Exchange Commission (SEC), both say essentially the same thing, and that is that there is plenty of business out there for companies to secure without engaging in bribery and corruption. Bharara went even further and said that those companies which move away from the sweet spot of doing business in an ethical manner to the edges of a system which tempt violations of the FCPA or Bribery Act are more likely to draw regulatory scrutiny. But perhaps the best example I have heard was during an interview I did of a company employee who told me that there was simply “too much money to be made in the middle of the road” without engaging in the high risk conduct which might require him to violate the FCPA. As noted by Coyle, most cyclists who cheated “did so largely without fear of being caught. During the Armstrong era, cyclists regarded drug testers with the same nod-and-wink aloofness with which Wall Street firms regarded the SEC.” (Ouch!) That statement is why companies must maintain vigilance in their FCPA or Bribery Act compliance programs. Indeed in the US Department of Justice (DOJ) 13 point, or 9 point – take your pick, minimum best practices compliance program or the UK Ministry of Justice’s Six Principles of an Adequate Procedures compliance program both point towards not only internal controls but also internal audit as key components of your compliance program. Whether you view it in the McNulty Maxims of “What did you do to prevent it?” and “What did you do to protect it?” or in the Ronald Reagan formulation of “Trust, but verify”; your compliance program must do more than just have policies and procedures in place, it must also have clear controls. I recognize that in cycling you can game the system to try and beat the tests. You can even try and bribe your way out of a positive test; you can schmooze your way out of a positive test; you can even have a friendly doctor who back-dates documents for you to show that you had a prescription for that banned and illegal substance. However, with rigorous internal audit, coupled by skeptical external auditors and use of continuous monitoring tools, companies should be better placed to detect indicia of bribery and corruption. Coyle ends his piece by stating that “The Armstrong era happened because doping worked so powerfully and lucratively that no one—not riders, not cycling’s governing body, not the media—was willing to stop it. It was a time of hollow magic.” This ‘hollow magic’ did not end until “the federal government and USADA began their respective investigations, did the truth begin to emerge.” Lance Armstrong yelled from the highest mountain, the question is how, even with a system biased and stacked against him, did he never fail a drug test? So at the end of the day I do not know who Lance Armstrong may be more like in the classic Frankenstein movies; Dr. Frankenstein or the Monster. He certainly became a physical cycling freak through the use of many different substances, but he lacks the pathos as the Monster was played by Karloff. So he may end up more like Dr. Frankenstein, who lost everything, including his own creation.